The Oak Book is a directory of services for male victims of domestic abuse put together by the Mankind Initiative. 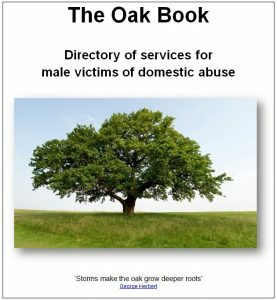 The Oak Book is designed to be used by professionals working with male victims of domestic abuse to help them see what services are available and also to network and share best practice. The third edition published in March 2017 is now available and has 200 entries. It is available to people working with male victims of domestic abuse in statutory authorities, charities and other supporting organisations. If you feel the Oak Book would be useful to your organisation please email admin@mankind.org.uk with your name, contact details and a brief description of what your organisation does and how this is related to male victims of domestic abuse.